BOFA INTERNATIONAL, a leader in fume and dust extraction technology for industrial processes, has announced it has won the Queen’s Award for Enterprise (Innovation) in its 30th anniversary year. BOFA says it has been awarded the prestigious accolade for the development of its Intelligent Operating (iQ) System, which is transforming the way that organisations around the world are able to protect the health of employees and improve production processes through more effective extraction of airborne contaminants in the workplace. 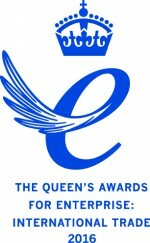 MCP, the Solihull based consultancy, providing asset management consulting and training services, has announced it is celebrating the award of the UK’s highest accolade for business success -The Queen’s Award for Enterprise: International Trade 2016.